Breast cancer awareness month is getting a boost from a surprising place… the football field. The NFL has teamed up with the American Cancer Society to support the fight against this disease with their campaign, A Crucial Catch. Throughout the month of October, you can spot the biggest football stars, plus coaches and referees, wearing pink sports gear, throwing special footballs and running on pink ribbon-adorned fields – all to raise awareness for this important cause. All of the apparel worn on the field will be auctioned off, benefiting the American Cancer Society’s Community Health Advocates National Grants for Empowerment (CHANGE) program. This program provides breast cancer screenings to women who would otherwise have difficulty getting tested. 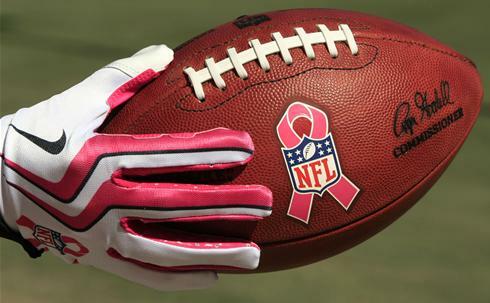 To join in on the conversation, use the hashtag #NFLPINK.